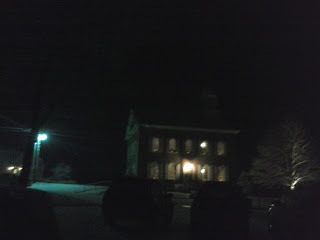 Tonight I attended a Christmas Eve service at a church that I believe some of my ancestors attended (Deininger family). I haven't made a direct connection on how exactly they're my ancestors, but that's just because I haven't found the links yet. I'm quite confident that my assumption is correct, as the family name on the headstones in the church cemetery link to a name uncommon for this area. I've ridden a school bus by this church nearly every day when I went to school for my entire childhood. I've held my breath as we passed by the two adjoining cemeteries, and if I took a breath next to the tombstones, it was considered bad luck. I never knew my ancestors were buried there until this last year, when I found their names among the burial records. It seemed wild that for quite a long time, my family has frequented these very same paths that I have traveled more than half of my life, although they likely used horses, carriages, buggies, bare feet or even sleighs. Yet this was the first time I've *ever* entered the doors of the chapel. And true to style, I was late. :) (But only by a minute or two.) It is Christmas Eve, after all, so I was a bit tentative to leave my husband and kids at home, but they didn't seem to mind me going. It had started snowing a few hours earlier, so the roads became a bit slick, and as I arrived, the other cars were plodding along. It reminded me of those imagined sleighs. Walking up to the doors, I almost didn't go inside. There was music being sung, and I didn't want to interrupt, but I decided to anyway! ha! The door was so old that I almost didn't know how to work the latch. Stepping inside, a woman smiled and gave me a candle and a program. I soon realized that they were necessary for participation. The inside was small! The building always looked so large from outside, but sitting in the third pew from the door, there were only two rows yet ahead of me. There was a center area for the Pastor to perform the communion, and then two side areas for pews, so that the whole setup was a small U. There were also balcony seats, although the area above was not lit, so I didn't see much of it. The pews looked to be original, and the decor and architecture looked like it was the best that could be done by laypeople, 300 years ago. It was mostly wood, and in the dim light I couldn't tell if there was a faux finish on the walls, or if the lines going each way were part of the original design. It appeared to imitate marble. I looked at the worn back edge of the pews, and wondered if these were the same that donned the chapel when it was originally built. Why am I writing about the details of this? Why did I go? I sat there, wondering the same thing. I try to be non-judgmental about other religious services, and still I sat there, pondering it all. The message was all pre-written down on our program. The ancient organ - older than the Mormon Tabernacle Organ - sounded like a baroque organ, very literally. It reminded me of the merry-go-round music at Hersheypark, minus the stomping drum. It played familiar hymns, and the choir and small congregation sang. Eventually, an offering plate was reverently passed around by ushers, and soon after communion was offered. Everyone seemed to partake of it, except me. This felt interesting, especially given my recent post on the Sacrament. This church offered, via writing in the program, for every "baptized Christian" to partake of the communion. Little children were invited to come and receive a blessing from the pastor. All were ushered to the front, row by row, by men or women ushers, to take a wafer from the female pastor/preacher (sorry, I was late and missed the formal introduction of who she was), and then a small cup of wine. I was petrified, and thought it was odd that I felt so. I've never had straight wine in my life, so I prayed, "What do I do? Why am I here? Am I the only one who won't be partaking? Are they going to think I'm "unbaptized" and will I get harnessed or preached to at the end of the sermon about being 'saved'?" It was an interesting sentiment. I wonder if this is how many people feel, who attend church for the first time. Shortly after, the service ended. I should add that in the middle was a sermon on the birth of Jesus. The preacher walked up several stairs to a podium (I assume this was created so those in the balcony could see? ), where she looked down about 7-8 feet to the congregation, and read every part of her message. It was peculiar to me. I tried not to judge, but I remembered my grandmother always having a problem when someone at our LDS Church would "look down her nose" while she would conduct the music from the stand in front. It reminded me of her comments. I am thankful to have visited this service, and to the woman who offered me a program and a candle so sweetly. I am thankful to have experienced another denomination's worship. Although not entirely different than my own, the spirit of the meeting was vastly different. While I'm not yet sure if it would have felt more comfortable if I were a regular visitor, I know that it helps me appreciate the spirit that I regularly feel within the walls of the church I am a member of. Yesterday, I listened as my former bishop and now a member of the Stake leadership shared a talk on various things, one of which was a beautiful explanation of Mary's many descriptions. On and on he went, listing the countless descriptions listed in scripture of her. It was beautiful to think of how extraordinary she was. A "chosen vessel", most fair, above all other virgins. Following him was a newly returned missionary, who used absolutely no notes for his talk. I bent over to my son and said, "Look, he's not using any notes at all. He's speaking with the Spirit." The only time he looked down was to read a verse from scripture. Now, I know and understand that just because someone doesn't use notes doesn't mean they're speaking with the Spirit. But it is my determination that he was. I was spellbound, seemingly. Likely only in his early 20s, this young man spoke with power and authority from God. With inspiration and guidance of the Spirit. He spoke truth. While I know nothing of the true character of the returned missionary and the preacher who gave tonight's sermon, I noted the difference of the spirit felt inside of me. Honestly, it felt like the difference between spiritual chilliness and spiritual warmth. The verse "they draw near unto me with their lips but their hearts are far from me" went through my head tonight, again and again. I wondered if that was the case, or if the preaching done was sincere. I hope so, but I'm glad it's not for me to judge the heart behind their words. I simply judge the warmth I felt (or didn't feel) inside. Thankful indeed for the memorable experience of attending this service, on the snowy Christmas Eve. May you each experience the warmth of the Savior's love and His Atonement this Christmas season, and each day thereafter.